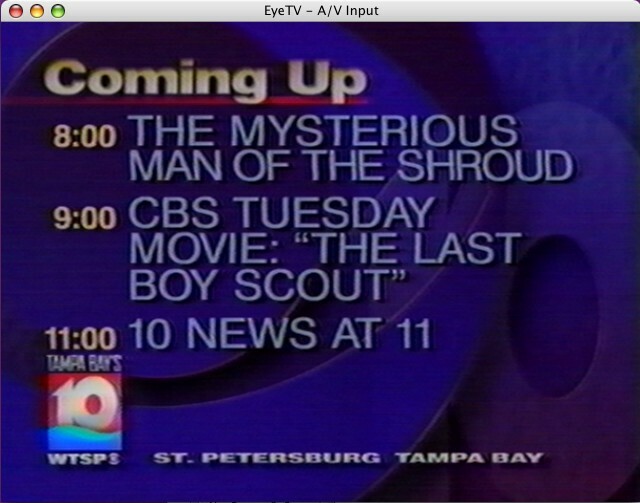 Okay, the main reason I bought the TV-recording device: so I could hook up my VCR and bring you 10-year-old Tampa Bay area station IDs. No, the real reason is so I can transfer my VHS tapes to DVD. That station ID preceded Pat Sajak guest-hosting "Jeopardy!" on April 1, 1997. I've got a bunch of VHS tapes that I'd like to transfer to DVD. In order to accomplish this, I bought a device called the EyeTV Hybrid, a little box that hooks to a Mac and can take an analog video input (say, from the output of a VCR) and save it as a digital recording. But it also has an over-the-air digital TV tuner built in. So that's what Paris Hilton looks like in high-definition! I'm not particularly impressed. With Paris, I mean. The HD actually is pretty impressive (it's better "live" on my monitor than in the scaled-down image above) -- on this local newscast, there's an obvious difference in quality between actual HD content and everything else (i.e., everything that didn't come from one of the local station's cameras). I may have to watch the Super Bowl while sitting in front of my computer.